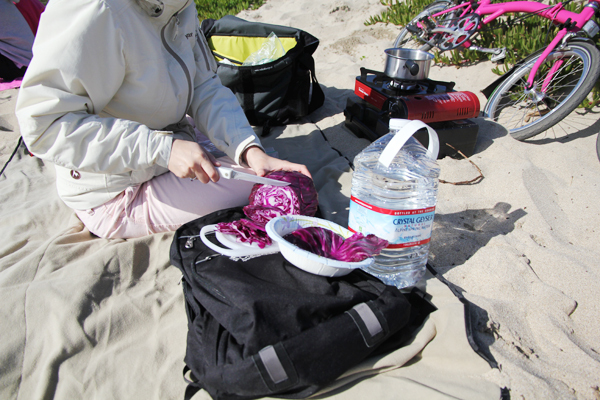 Last post, I shared the first part of our experience biking in Half Moon Bay and cooking a recipe from a bicycling/camping cookbook called The Weekender by Pedal Inn. I continue here with the second part. So, what happened to that pot of cabbage? Sadly, for our stomaches, nothing! Because of the strong and cold winds, the water could not get to a temperature hot enough to boil. The wind kept minimizing the flames from the propane stove. So I could not boil the shredded cabbage and when it had come time to sautee it in the pan, I surely wouldn’t have been able to. 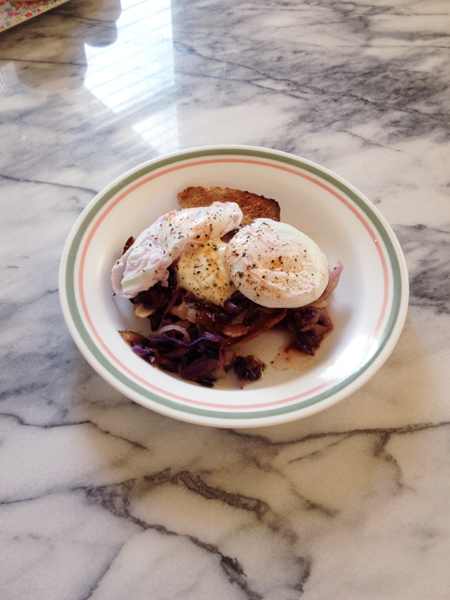 The cabbage was an essential part of the Eggs Benedict recipe- the delightfully poached eggs were to sit upon a savory bed of sautéed red cabbage with onions and garlic, topped with creme fraiche and served with slices of hearty bread. We tried cracking an egg into the pot to see if it would cook and it never did. While we were still waiting for the pot to boil, a little chubby boy was walking by on the sand and when he saw our pot he exclaimed, “That’s cool!” In my head, I was like, “You have no idea, kid!” Chris said he got really appetized waiting for the pot to boil and had been looking forward to the meal. So we were both disappointed when we couldn’t get the stove hot enough to cook the food. I was sure the dish would have been delicious if we had been able to cook it. The windy and cold weather did not cooperate with our plans, and we later found out that the first part of the year is not really the best time to visit Half Moon Bay. It is warmer and less windy during the latter half of the year. Also, I used a propane stove which I think is designed more for indoor use. They make stoves specifically for camping and those burn alcohol. Maybe that could have withstood the wind better. Defeated, we packed up our stuff, shook the sand out of our bikes and then headed home. But in my head, I was determined to try this dish. I had to know how it tasted! I was going to try again, but this time in my own kitchen. I still had the unopened pack of creme fraiche. I had the carton of eggs we bought and there was still a lot of red cabbage left. One morning soon after our excursion, I made the recipe at home and it came out fantastic! The flavors blended wonderfully and the dish seemed fresh and healthy. I don’t have a lot of experience poaching eggs so I kind of overdid them, but nevertheless, when I ate them with creme fraiche, it was heaven. I could imagine how much more wonderful it would have been to eat this dish at Half Moon Bay on a good day, with the sights of the sea, sky, and cliffs. I didn’t make the poached eggs well, but the dish still came out delicious especially because of the creme fraiche. Now, about The Weekender cookbook, I really liked and learned many things from it and the whole experience. I now use the combo of creme fraiche with poached eggs on a regular basis- yum. Even though I don’t personally feel cut out for camping and cooking outdoors, I think the recipes are still great for cooking at home. I think they really represent the flavors of California and Bay Area cuisine. For anyone who loves the outdoors, camping, biking, and cooking or is curious to try, I think this cookbook is the perfect resource for you. It will challenge you a bit which is what I think is part of what makes the outdoors exciting. Challenging yourself to go to new places, climb a hill or mountain (with your two feet or two wheels), and then achieving that great reward at the end- a sense of accomplishment, amazing and breathtaking views, and renewed sense of wonder about nature and the world. 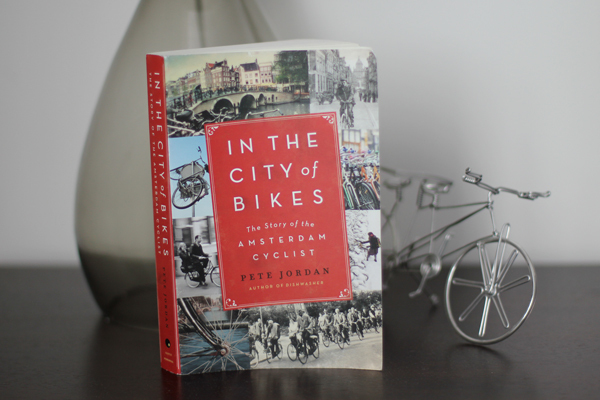 As it pertains more to biking, it is also a great reflection of the biking experience. In a previous post titled Exploring A City by Bicycle (a love letter to urban biking), I wrote about how biking is a very sensory experience where almost all your senses are engaged. When biking, you see many things with your eyes, you hear and smell the world around you, and you feel the breeze on your skin. The one sense missing is that of taste. This cookbook, The Weekender, fills in that last piece bringing the biking experience and taste together to create a complete experience for all your senses. So I believe that with this book, and for those who have the initiative and drive for adventure (and good eats), the rewards reaped will be like a “sweet song that you [and your tastebuds] will remember for as long as you can”. 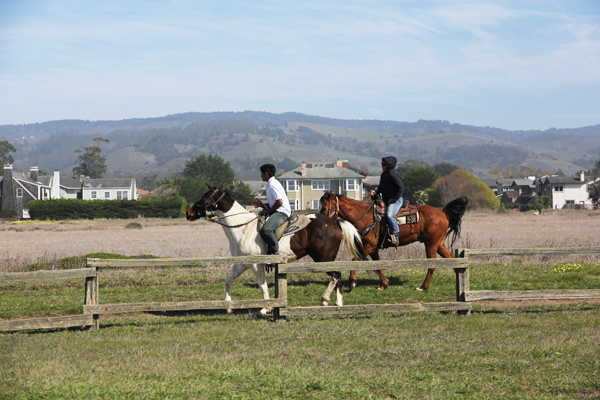 In this post, I share our experience biking in Half Moon Bay, California and cooking a recipe from The Pedal Inn Weekender cookbook right on the beach. If you love biking and eating/cooking, then read on! Our bikes and cargo overlooking the sea at Half Moon Bay. A few years ago, on one of our memorable nights out biking with the SF Bike Party at a rest stop upon a hill taking in the sights of the beautiful city, someone handed us a yellow matchbox with an illustration of a crest on it with “The Pedal Inn” written across the top and an image of two people wearing outdoor gear having a picnic beside their bicycles. On the back it read, “For lovers of adventure and good eating”. I was curious what that was and the woman who handed it to me told me it was a cookbook. I was intrigued because I love biking (that’s the name of our blog) and I love eating and cooking too and here was a couple that had combined these things into a single concept that they could share with others- a cookbook and guide to biking/cooking/camping. After visiting their website at www.pedalinn.com I said to myself, I have to try this one day! Not too long ago, I decided it was a good time to try out the cookbook. Thanks to Nick and Lindy, the authors of the cookbook, I was able to get a copy of it for myself. When it came in the mail and I unwrapped it, I saw it was beautifully put together. Inside the plastic pouch, was an assortment of booklets/pamphlets. 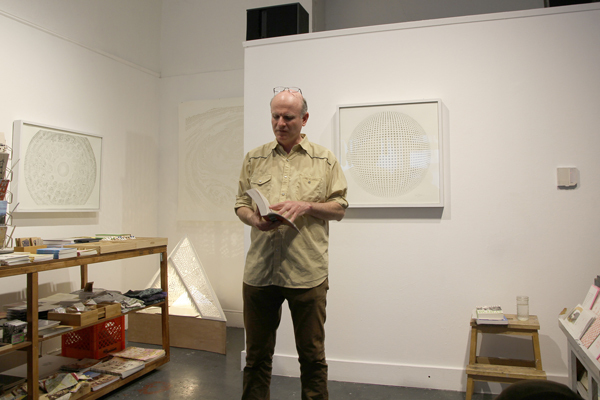 The main book had Weekender written across the front and was nicely illustrated inside and out. The others were more like simple folded pamphlets with recipes in them and were designed to be easy to travel with. 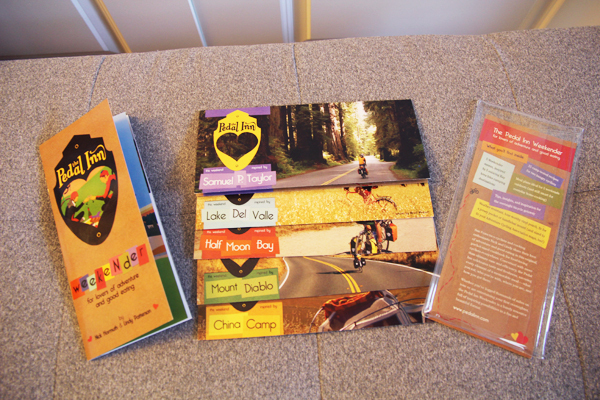 Each recipe pamphlet had the name of a great Bay Area biking locale such as China Camp, Lake Del Valle, and Mount Diablo to name a few and the corresponding recipes that matched the theme of each place. 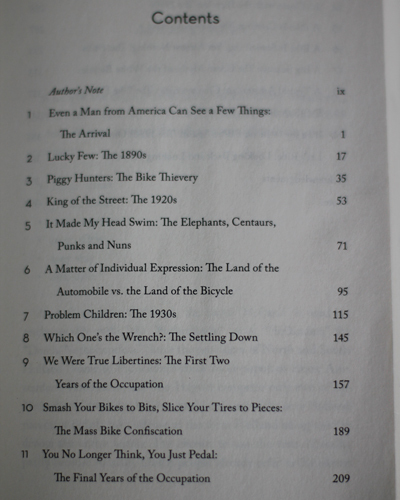 The writing was a joy to read and it began to dispel the mysteries of camping/biking/cooking to me. The Pedal Inn Weekender cookbook. 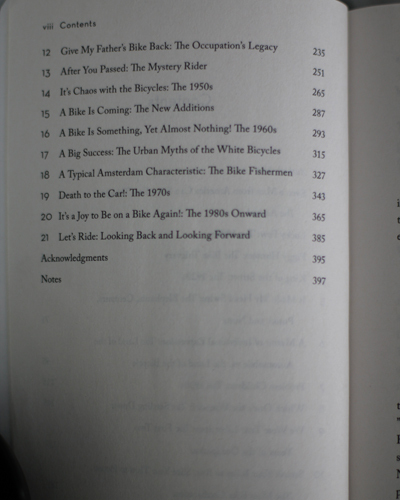 You see, although I love biking, I have very little experience in the long-distance touring sort of rides. Also, I have only camped outside maybe once or twice in my life when I was young and my much older sisters took care of everything. They packed the tents and brought all the provisions. I still remember the yummy baked bananas my sister made over the grill using foil but I didn’t really know how it all came together, just that it tasted unbelievably good (something about eating food in the great outdoors enhances it). So as I perused these guides with names of places that called out to the adventurous side of me, a feeling of anxiety began to set in. After cooking for five nights a week for the past seven years, I can now say I know how to cook with complete confidence. So perhaps it was because I know how to cook that seeing the recipes made me break into a sweat. Because of my experience, I could quickly see this wasn’t just a cookbook about throwing together some Chex Mix to bring with you onto the trail. This was, you could say, gourmet stuff and what made it challenging was picturing myself trying to cook this stuff not in a kitchen in the sterile comfort of my home, but outdoors in an unpredictable and variable environment. I was sure the efforts would probably have been worth it once we tasted the finished dishes, but getting to that point was the hard part. Fast forward two weeks later, and it is the morning on a fine Sunday. Chris and I are shuffling around the house trying to pack stuff. I grab our propane stove we have used many times for Chinese hot pot. I grab some spatulas, spoons, and pour some olive oil into a small plastic case. I didn’t pack everything I needed because the idea was that we’d stop by a market along the road during our bike ride to buy fresh ingredients. That would be part of the Pedal Inn experience. 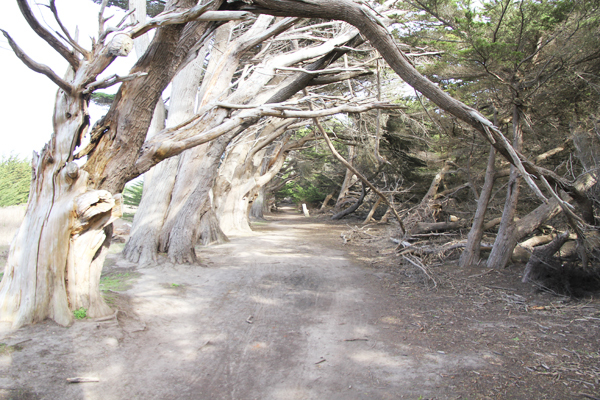 Our destination was Half Moon Bay, a place where we would ride along a path overlooking the sea and then camp out on the beach for the afternoon. 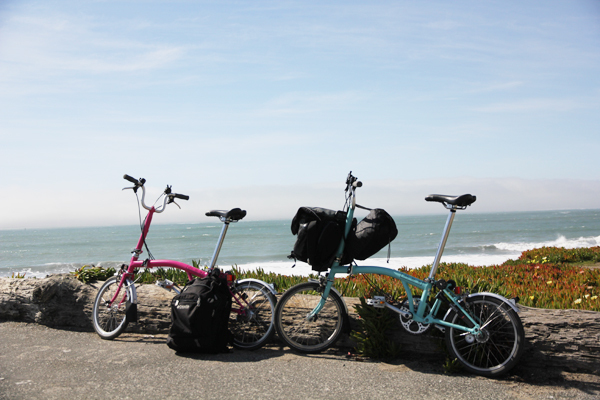 The recipe pamphlet for Half Moon Bay was stuffed into our Brompton bag pocket, and we were off in our tiny car with the bikes and cargo stuffed in the back. When we got to Half Moon Bay, we first stopped into a market on Main Street. We found what we needed there and even a fresh pack of creme fraiche. We were going to make Pedal Inn’s version of Eggs Benedict. They use creme fraiche instead of Hollandaise sauce. That was just the breakfast recipe and the only one I felt confident enough to try. They also had a recipe for dinner and dessert. Dinner was Fish Tacos with Pom-Persimmon Salsa and dessert was Blackberry “Shortcake” in origami folded cups. Sounds delicious, doesn’t it? These are also the perfect recipes for Half Moon Bay, a place by the sea that is influenced by Mexican culture due to the migrant workers that live in the area and who work on the local farms. 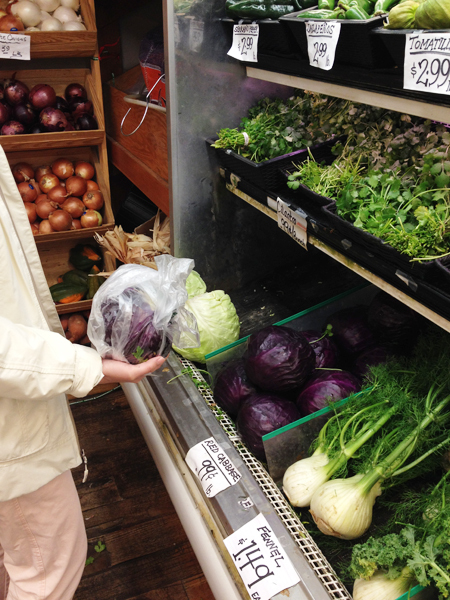 Red cabbage at Cunha Country Grocery Store at 448 Main St. in Half Moon Bay. We then rode our bikes along the path by the beach and it was a picturesque and lovely experience. The view was amazing and the waves crashing onto the beach were furious. We saw people riding horses and many people walking along the path. People were sitting out on the beach down below. I had the stove in a backpack on my back along with all the ingredients. It was getting kind of heavy. Having panniers would have helped a lot with that. One of the interesting wooded parts of the path. Some people rode horses and we rode horses made of steel. 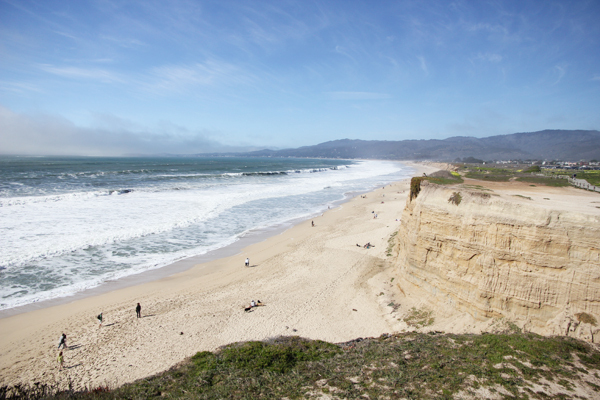 Ahhh, the beautiful sea at Half Moon Bay. This story is getting long so check back next post for what happened to the pot of cabbage!